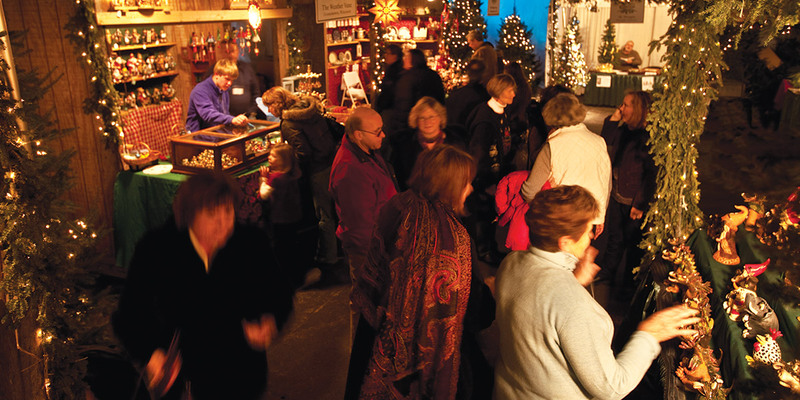 The Old World Christmas Market makes a great getaway and fun-filled day for groups of all shapes and sizes. An overnight motorcoach tour, a one-day bus trip or a middle school or high school German Class... everyone in your group will enjoy a day at the Christmas Market. Additional meals and activities, beyond what is offered inside the Christmas Market, may be added onto your visit including dining in our restaurants or banquet rooms, cooking courses, local attractions and demonstrations. Discounted Group Rates: Groups of 20 or more will receive admission into the Old World Christmas Market at a cost of $6, per person, with advanced ticket purchases. We invite you and your group to join us for the 22nd annual Old World Christmas Market, December 6 - 15, 2019. The Old World Christmas Market was named one of North America’s Top 100 Best Events in 2012 by the American Bus Association. Click here for press release. Stay in one of our spacious suites and enjoy all the comforts of home while taking in the holiday decor and traditions of The Osthoff Resort! $88, per person, inclusive, Sunday - Thursday evening. Add an additional night's stay for $68, per person, inclusive. *Rates based on double occupancy. $108, per person, inclusive, Friday evening. Add a Saturday night stay for $88, per person, inclusive. $58 per person, inclusive, Sunday - Thursday evening. Add an additional night's stay for $38, per person, inclusive. *Rates based on quadruple occupancy. $68, per person, inclusive, Friday evening. Add a Saturday night stay for $48, per person, inclusive. Click here to view room layouts. Enhance your stay with a delicious breakfast, lunch or an elegant dinner. The Osthoff Resort provides a number of dining options with an emphasis on a relaxed and comfortable dining experience. We offer special menus specifically geared towards our Old World Christmas Market tour groups including a special German holiday dinner! Why not stay an additional night and visit these other wonderful area attractions that are decked out for the holidays! The Wreath Factory - Discover the art of wreathmaking with a tour followed by a demonstration illustrating different techniques and styles. Kristmas Kringle Shoppe - This two-story Bavarian-style shop boasts an interior resembling the streets of quaint European shops. Also features the largest selection of Italina ornaments in the nation and other lines of collectibles. Holiday Memories Tour - Historical Museum offers tours "through time" amid holiday exhibits depicting Christmas through the ages. Featuring the popular Prange store window animations. Abler Art Glass - Offers hand-blown glass art to enhance any garden, patio or home. Also featured are original oils, pottery, sculptures, metal art, jewelry and more. Kohler Design Center - View unique exhibits depicting the evolution of the Kohler Company. Displayed in the art gallery are the original pieces of ceramic, cast iron, and brass work created by national artists in the Kohler factory. Shops at Woodlake - Enjoy browsing an eclectic collection of shops and boutiques. For more information or to book your group tour, please contact Angela Koran in The Osthoff Sales Department at 920.876.5815 or email akoran@osthoff.com.